Beautifully furnished white water view beach front five bedroom home on a private beach in an exclusive gate guarded community. The living, dining and kitchen area have sliding doors opening up to the beach front patio. The first floor has a queen bedroom along with a bathroom, and a two car garage. On the second level there is a master suite with a king bed that has a view up and down the coast from the Dana Point harbor to the San Clemente pier and well beyond seal rock. In addition, there is also three more bedrooms that have a king bed in one bedroom, a queen bed in another bedroom, and a set of bunk beds in the third bedroom. The bunk beds have full size beds on the bottom with twin beds on the top. There is also a large bathroom with dual vanities on the second floor in addition to the master bath for the master suite. Best yet, awesome oceanfront location on the sand. Beach Road is located between the San Clemente Pier and the Dana Point Harbor in a one of a kind Southern California Beach Front Community with views and privacy unparalleled in Southern California. The homes allow you to step out on to your own private beach with additional miles of public beach for daily activities and exercise. Here, you can experience Southern California coastal living at its finest. The sun, surf and abundant Southern California vacation activities can’t be matched. The exclusive gated community of Beach Road provides privacy and seclusion not commonly associated with beachfront property. Here you can come to relax, surf, play tennis, ride bicycles along the coast bike path, walk the beach, gaze at brilliant starlit skies, or just sit on the deck and watch surfers, pelicans, and dolphins while you feel the romance and energy of the ocean. Geographically located in an area known as California's Riviera, 'one can expect the best coastal weather in Southern California.' The property is located right on the beach so you can expect to see schools of dolphins, and surfers. In addition it is near both Doheny and Poche, two of the best surfing spots on the west coast. Relax in the private enclave of the Beach Road Colony, and enjoy comfort and ambiance that is guaranteed to make you wish you never had to leave. At 60 miles south of Los Angeles, and 65 miles north of San Diego, we are just 45 minutes to Disneyland, 25 minutes to Lego Land, 60 minutes to Sea World and within an hour of all the other great attractions Southern California has to offer. Our rental is very centrally located to all major airports, shopping, theme parks, wineries, and fine restaurants. Dining in the surrounding area consists of a famous Mexican restaurant, an Italian restaurant and Sushi within walking distance. We also have waterfront dining on the San Clemente Pier or in the Dana Point Harbor. There are many more upscale restaurants in the vicinity due to the proximity of the nearby Luxury Hotels inclusive of The Ritz Carlton, The St. Regis and The Montage Resort. Shopping in the area has everything from the Shops at Mission Viejo to South Coast Plaza and Fashion Island. They all offer valet parking and more items than you can possibly imagine. We love working at the beach! Front row forever view on the California Riviera. No lawn to mow just enjoy the beach. Located right on the sand with an amazing ocean view. Air Hockey Table in Garage along with round table for puzzles or games. BEST beach rental we've ever done! We have rented homes and cottages all over the world. Having three children (17, 14 & 5) and travelling with a nanny or grandparents over the years, makes booking Hotel rooms very challenging. The Beach house was the best equipped home we have stayed in to date. The manager was very responsive to all enquiries and we had no difficulties. All appliances were functional and up to date. My children were thrilled to be greeted with the equipment to make s'mores in the fire pit. The view from the master suite was breath-taking. There is so much to this rental property I do not have enough space to list all it's attributes. Some highlights for me where the fully stock Krueger, fully stocked bathrooms, complete assortment of beach toys, surf boards, wave boards, plenty of indoor and outdoor seating. Two tranquil fireplaces, very large bedrooms, a very well equipped kitchen. The home even supplied a cooler bag with cooler packs for the parks. We did not lack anything and other than food never needed to venture to a shop. The home had a book with directions to anything you could ever want. In using this directory we came upon our favourite breakfast location with the best crepes outside of France called "Stacks". The highlight of this vacation was watching dolphins playing just off the beach while eating breakfast and the pelicans feeding every morning. My children slept in the back rooms by the train tracks and I never heard any comments about the trains that occasionally past by. The five year old is a very light sleeper usually awaking at the crack of dawn. Not sure if it was the fresh ocean air but my husband and I thoroughly enjoyed sleeping in for the time we were there. We chose the beach house as it was in the perfect location in between LA and San Diego. We spent a great deal of time at Disney, Legoland/Sea-life, Universal Hollywood, San Diego Zoo, shopping and at the beach in the backyard. Thank you for opening your home to us. We loved the property and the location. I/we highly recommend the beach house, it's absolutely stunning! We(3 families) spent our Easter vacation together in this great property. The beach right outside our door was such a big hit with kids and adults alike! We would have nightly fires on the beach and the best sleep listening to the waves crash on the beach. 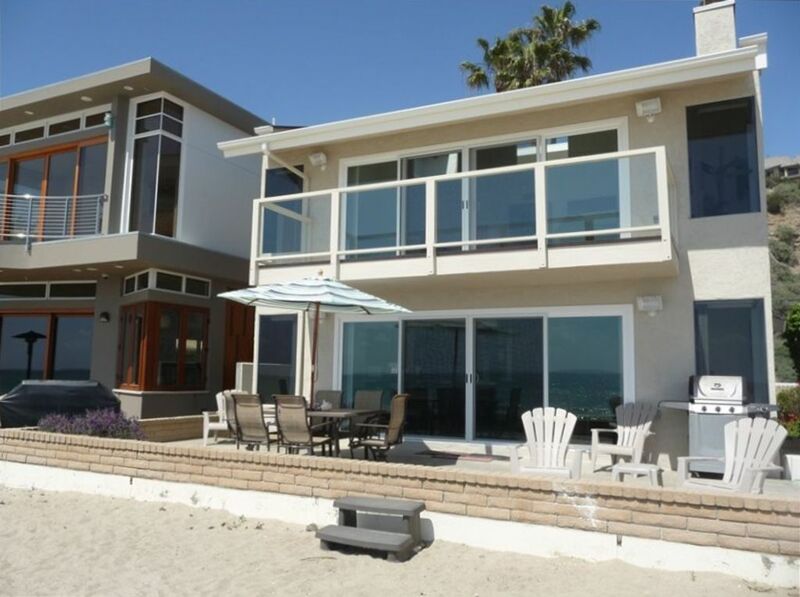 This house has everything you need,boogie boards,surf boards,sand toys and enough beach chairs for everyone. We did not want for anything, except more time there. It is a central location for all theme parks, close to the I-5 and the pacific coast hwy. We would all recommend this home and would love to come back. A special thank you to the property owners who added the hockey channel for us die hard Canadian hockey fans, you sure know how to cater to your guests!!! The location between Los Angeles and San Diego enables easy access to many California attractions. A few choices are Disneyland, Knotts Berry Farm, Magic Mountain, Universal Studios, Beverly Hills Shopping, Sea World, Temecula Wine Tasting, and Lego Land. In the local Dana Point area the harbor offers a marine institute and a rental center for jet skiing, kayaking, sailing, biking, etc. Golfing and tennis are also in the vicinity. Swimming, surfing, playing in the ocean are just outside on the beach. Volleyball, basketball, and beach fires are also available just steps down the beach.